It's last item in menu, here described as "Konfiguracja"
1) Language selection, you may choose one of languages supported by OOo2GD, for now those languages are: English, Bulgarian, German. Polish, Russian, Spanish, Italian, Portuguese (Brazilian), Chines (Simplified), French, Czech, Hungarian. You may also select language "System" [it is default choose], and OOo2GD will try to use your system default language [if it will be one of supported languages] or similar dialect to system language, or English. 2) Look & Feel, it lets you choose which Look & Feel should be used by Java to render OOo2GD dialogs. If you see all known for me looks & feels see on my blog (in Polish, but pictures are the same in all languages ;-)). On Windows 7 I'm using Look & Feel Nimbus which was added in Java 6. In User you should provide user name for proxy, and in Password you should provide password to proxy server. OOo2GD works in all tested by me HTTP proxies, also with NTLM proxies used in most of corporations. User and Password for proxy will be stored on your local disk. If you are using OOo2GD on the same machine one time with network with proxy, other time in network without proxy it will work. OOo2GD will try to connect over proxy, and if it will be impossible it will try to make direct connection to servers. 4) This option works when option 8) isn't marked. This lets you with 5) and 6) to determine where OOo2GD should store downloaded from Google Docs/Zoho files. 5) Path where OOo2GD should store downloaded files. 6) Button for setting path where OOo2GD should store downloaded files. 7) Determine behavior of OOo2GD in case when in given location you have file with the same name. If this checkbox is checked OOo2GD will try to overwrite already existing file on your disk. If it will not possible OOo2GD will create another file with name and number (like Firefox). 8) If this radio button is marked OOo2GD will asks each time where it should store downloaded file. 9) Default autoupdate. 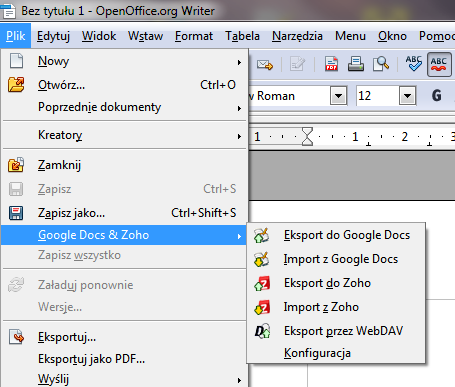 If this checkbox is marked OOo2GD will check autoupdate checkbox on Import and Export windows, thanks to this synchronization between local copy and Google Docs will be much easier. 10) This button shows error log of OOo2GD, in case of problems please attach content of this window to error reports.